Lord Ganesha is celebrated in all major traditions of Hindu religion, in fact, he is one of the most beloved deity in the Hindu dharma. Known as the destroyer of obstacles, he is said to bring happiness, security, and prosperity. Ganesha temples in India are some of the best temples in the country, both in terms of grandeur and meticulous architecture. Housing the quite unique Siddhivinayak Ganesha idol unusual carved out of a single black stone and with Ganesha’s trunk to the right instead of left, the temple, is known for its wish-granting capacity. Located in Maharashtra, Mumbai is considered to be the most famous Ganesha temple, evidently, even the Bollywood stars queuing in front of the famous temple. The roots of also the richest temple in Mumbai, receiving 150 million in donations alone every year go back to the beginning year of the 19th century. The original temple, a modest 3.6 sq.m. brick structure was commissioned by Laxman Vithu and Deubai Patil. The temple was built with the purpose of granting the wishes of barren women. 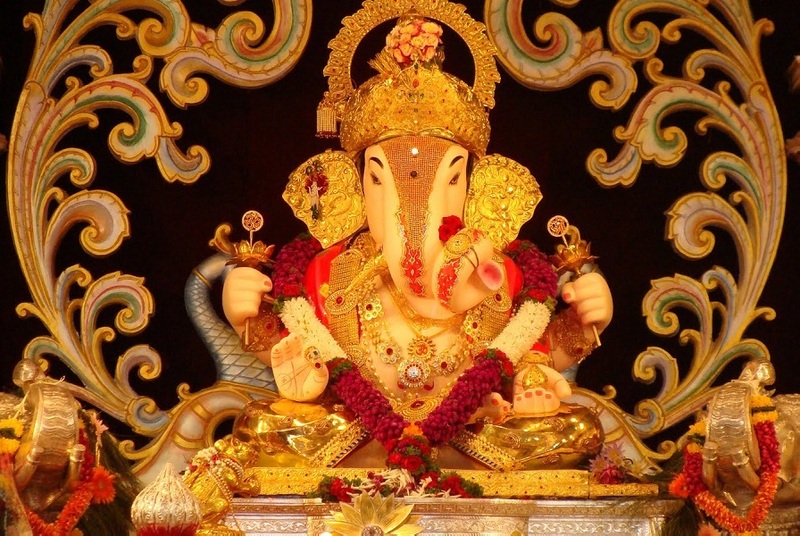 Over the years, though, Siddhivinayak Temple has expanded over the centuries into a modern landscape of huge structures and so has the repertoire of wishes that its deity grants. Famous for its intrinsic design and its golden idol, the temples boasts the rich history of over a century. Established in 1893 by grief-stricken Dagdusheth Halwai, a sweetmaker from Karnataka who lost his son to the deadly plague, the temple has a lot of historical significance too, as the celebration of Ganapati festival in the entire of the Maharastra was commissioned with the establishment of the temple. The temple houses the golden idol, the elegance and the meticulous features of the 7.5 feet tall and 4 feet wide idol adorned with more than 8 kilograms of gold and studded with diamonds cannot be simply explained in words and to call it merely beautiful would be an understatement. Located in the tourist city of Pune, it receives millions and millions of devotees and visitors every year. A unique sanctuary of Ganesha located in the middle of the river Bahuda, Kanipakam Vinayaka Temple was constructed in the 11th century by the Chola King Kulothunga Chola I and is known for its historic structure and intrinsic designs. It is Located in Chittoor of Andhra Pradesh and is also referred to as the Magical Ganesha Temple; as the devotees believe a dip in the holy water of the temple helps them get rid of evil forces and sinful doings. As the tales have it, three brothers with physical deformities of voice, vision, and speech discovered the idol of Ganesha while digging a well and very soon after this divine experience all three got rid of their deformities. Even today the idol of Vinayaka (a self manifested form of Lord Ganesha) is in the origin well and the springs of the well are perennial and believed to be eternal. 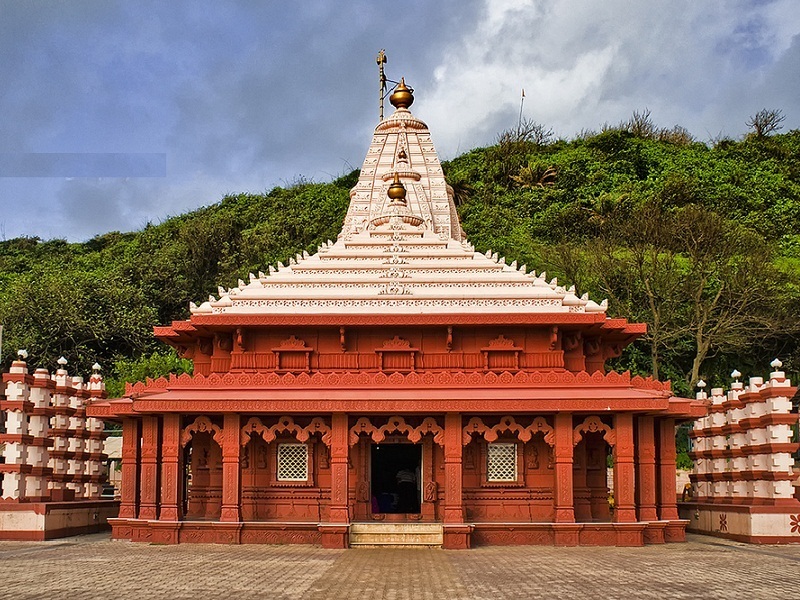 Located in Ratnagiri district in Maharastra, the temple houses a 400-year-old Ganpati idol that faces the West, unlike most idols, which face eastwards. Also, it is believed that the idol in the temple is self-evolved. The temple is constructed in a way that the sunlight directly falls on the idol during the month of February to November. Located near a hilltop; devotees take a ‘pradakshina’ around the hill as a form of showing reverence. Constructed about three centuries ago, in the then territory of the French colony, the Manakula Vinayaka Temple today is an important itinerary of the Pondicherry tourism. As the legends have it, the Ganesha idol here was being thrown into the sea several times, but it reappeared in the same place every day, making the place famous among worshippers. Till date, the idol is positioned at the same spot. Brahmotsava and Ganesh Chaturthi are two most important festivals of the temple, celebrated with great fervor and zeal by the people of Pondicherry. Widely famous for its huge monolith of Lord Ganesha, which is about 18 feet high and 16 feet wide, it captivates hordes of visitors every day, not just the residents of Banglore but devotees and tourists from all over the world. Kempegowda I, also famous as the founder of Bangalore is credited with the construction of this temple. This temple is at its best during the week-long known Ganesha festival, it is when the idol of Lord Ganesh is decorated in different ways. The most captivating one being the Benne Alankara where the idol is smeared with a whopping 100 kg of butter and the Ganesha Idol is decorated with golden laces and buttons. 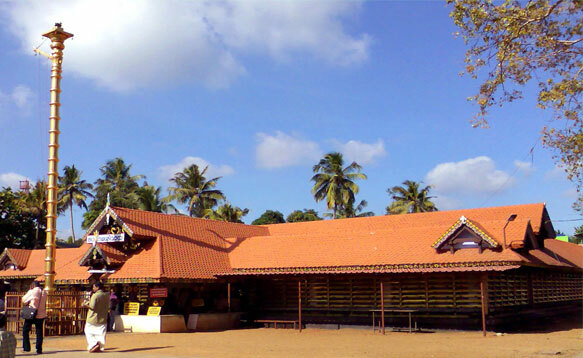 Located at Kottarakkara, Kollam, Kottarakkara Sree Mahaganapathy Temple is a is a Mahakshetra (major holy destination) with a golden dwajasthambam (flagpole). The most important Ganapathi Temples in Kerala, apart from the presiding deity, Lord Shiva, Goddess Parvathi, Lord Murugan, Lord Ayyappa, and Lord Nagaraja are also worshipped here. Though the main deity of the temple is Lord Shiva. However, the temple is famous as a Ganapathi temple. 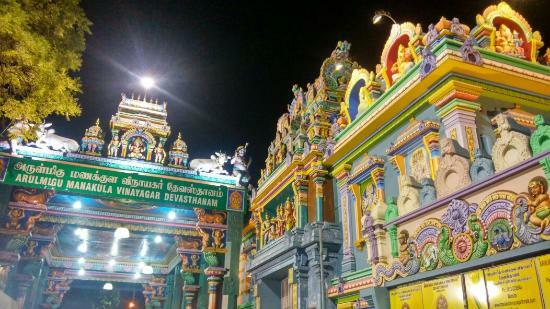 Built in the 7th century, the Ucchi Pillayar Koil temple is situated in Trichy in Tamil Nadu. The temple is placed on the tip of a huge rock and has got some wonderful rock architecture. A splendid view of Trichy awaits you when you climb the 417 steps cut through the rock, to reach the temple. Though famous as a Ganesha temple, it is the adobe of both Shiva and Lord Ganesha. The Moti Dungri Ganesh Temple is carved out of stone and is known for its amazing lattice work on marble, encapsulating some mythological images that offer a splendid view for art-lovers. Whether it is Ganesh Chaturthi or Paush Bada, the temple is always bustling with preparations. A must visit for those who want to unfold the rich history behind the built. Constructed by Seth Jai Ram Paliwal, Moti Dungri Ganesh Temple is located in the heart of Jaipur, the pink city. This temple was initially built to house the idol ‘Ganesha’, with only the Lord Shiva followers visiting this place. Later, the palace complex – Moti Dungri was built around the temple, though an imitation of a famous Scottish castle, it has turned out to be a key tourist attraction in the pink city. The temple is located in North Kalamassery and is dedicated to Lord Ganesha including Subramanian, Navagrahas, Shiva, Parvati and Rama. The temple is built in 1980 and has a simple construction and covers an area of 5,000 square feet. Since the last two decades, Ashta Dravya Maha Ganapathy Havana and Aanayoottu are organized annually on the first day of Karkkidakom month of the Malayalam calendar. Gajapuja is also organized once in four years.